Deciding whether or not to commence divorce proceedings is one of the most important decisions that you will make in your life. We will offer you practical and effective advice to guide you through the process and achieve the best possible outcome for you and your family. We are also able to offer fixed fee packages to help you budget financially during this difficult time. If your marriage has broken down and divorce is to be the next step, our experienced family law solicitors will be able to offer you advice through the entire process, outline your options, and ensure that your divorce will be dealt with effectively. We will represent you throughout the whole divorce process for a fixed fee of £550 plus VAT. • advising you at each stage of the divorce. We will represent you throughout the whole divorce process for a fixed fee of £350 plus VAT. Once divorce proceedings have started, the Court then has the power to make financial orders between the parties. We will offer you practical and constructive advice throughout the process, so that you can be confident of your rights and be able to negotiate effectively with your spouse to achieve the best outcome for you and your family. We appreciate that the breakdown of a marriage is a very personal issue, requiring specific advice for your particular circumstances. Our experienced family law solicitors will provide you with practical and tailored advice in relation to all issues which may arise from the breakdown of a marriage. We can advise you about issues such as how to deal with your family home, spousal and child maintenance, pension sharing, and how to deal with business assets. Where necessary we will work with independent financial advisors, accountants and pension actuaries to ensure that we will achieve the best outcome for you. In many cases the parties will be able to reach agreement with regard to the terms of their financial settlement without having to make an application for the court to determine the issues. In this scenario we will be able to prepare a financial consent order and all other associated documents for submission to the court for approval. However, and if you and your spouse are unable to reach agreement, we can advise you in relation to making an application to the court for a financial remedy, and we can represent you at court in such proceedings. If you are not married, then upon the breakdown of your relationship there is no automatic right to make a financial claim against your former partner. Such cases are commonly known as “TOLATA claims” as they are brought under the Trusts of Land and Appointment of Trustees Act. However, you may able to make a claim regarding a property, even if it is owned in the sole name of your former partner. Furthermore, and in some circumstances, the court can order additional financial support if you have children together. We will offer you practical and constructive advice so that you can be confident of your position. There is a common misconception that living together will lead to an unmarried couple becoming “common law spouses”. However, this is incorrect, and simply living together in a property for any set period of time will not mean that you will have the same rights to make a financial claim against your former partner as if you were married. Even if you are not able to make a claim yourself against your former partner, if you have children together then you may be able to make a claim under the Children Act for additional financial support for the benefit of your children. Our experienced family and civil law solicitors can provide you with practical and tailored advice in relation to all issues which may arise from the breakdown of a relationship. We can advise you of whether you are able to make a financial claim against your former partner, or alternatively the merits of defending a claim which has been brought against you. Mr Clark acted for the claimant in the much publicised case of Cahill v Farrer (High Court July 2016) whereby a former unmarried cohabitee made a successful claim in respect of a property that her former partner claimed was really his. Our experienced family law solicitors will offer you practical and understanding advice in relation to all issues concerning children, such as with whom they should live, how much time they should spend with the other parent, or if the local authority (social services) have become involved with your family. We understand that disputes involving children can be very emotional and stressful. We will deal with your concerns in a professional, understanding, and efficient manner and provide you with tailored advice so you can make the best decisions for you and your family. We deal with all manner of issues and applications involving children, such as with whom they should live, how much time they should spend with each parent, which school they should attend, and special guardianship orders. If you wish to move to a different country with your child we can deal with an application for you to be granted permission to do so. If you do not have parental responsibility for your child then we can advise you how to obtain this, and prepare the necessary paperwork for you. We are also able to advise parents, grandparents, and other family members in relation to situations where the local authority (social services) may have become involved with your family. If you are a parent we are able to provide you with free legal advice and representation (legal aid) throughout the public law outline process, and also in relation to court applications which may be made by the local authority (such as applications for emergency protection orders, care proceedings, and adoption). A Cohabitation Agreement is something we would strongly recommend for couples who have chosen to live together without the legal protection offered by marriage or civil ceremony. In simple terms, it’s an agreement you come to together outlining what will happen to your shared assets in the unfortunate event of a relationship break down. Other factors to consider may include; who will be responsible for day to day management of finances, how will debts be managed, how will your children be supported. Our skilled advisors can draw up an agreement ensuring that, regardless of what lies ahead, you both have clarity and shared expectations for the future. Many couples are now deciding to enter into a pre-nuptial agreement before getting married, so that in the unfortunate event of their marriage breaking down, they will have already set out in clear terms to each other how they will want their finances to be dealt with upon separation. A pre-nuptial agreement is a legal agreement made between a couple before their marriage has taken place. The intention of the agreement is to set out how the couple wish their assets to be divided if they later separate or divorce. They can be particularly useful if one party is seeking to safeguard an inheritance they have received, or if they already own a house in their sole name. Although a pre-nuptial agreement is technically not binding on the court, provided that certain conditions are met they will be a factor that the court will take into account, and they can be extremely persuasive to judges who will not overturn a pre-nuptial agreement lightly. Our experienced family law solicitors can provide you with practical advice in relation to these agreements, and also draft them for you. No one should have to suffer domestic abuse, and our experienced and understanding family law solicitors will provide you with practical advice about what you can do if you find yourself in such a situation. If necessary we can obtain urgent court orders to protect you and your children. Domestic abuse can take many forms, and can include harassment, threats of violence, verbal abuse, or actual violence. If you are suffering from any form of domestic abuse from a partner, former partner, or other family member, our experienced family law solicitors will be able to offer you practical and tailored advice and assistance to help protect you and your children. We are able to deal with applications to the court (on an emergency basis where necessary) to seek injunction orders to protect you and your children from domestic abuse. We are able to seek orders forbidding the other party from having any contact with you (and your children if necessary), as well as orders which will prevent the other party from coming to your home. In certain circumstances we may also be able to provide you with free legal advice and representation (subject to you qualifying for legal aid). Ask us whether you may be entitled to Legal Aid to help with your legal fees. 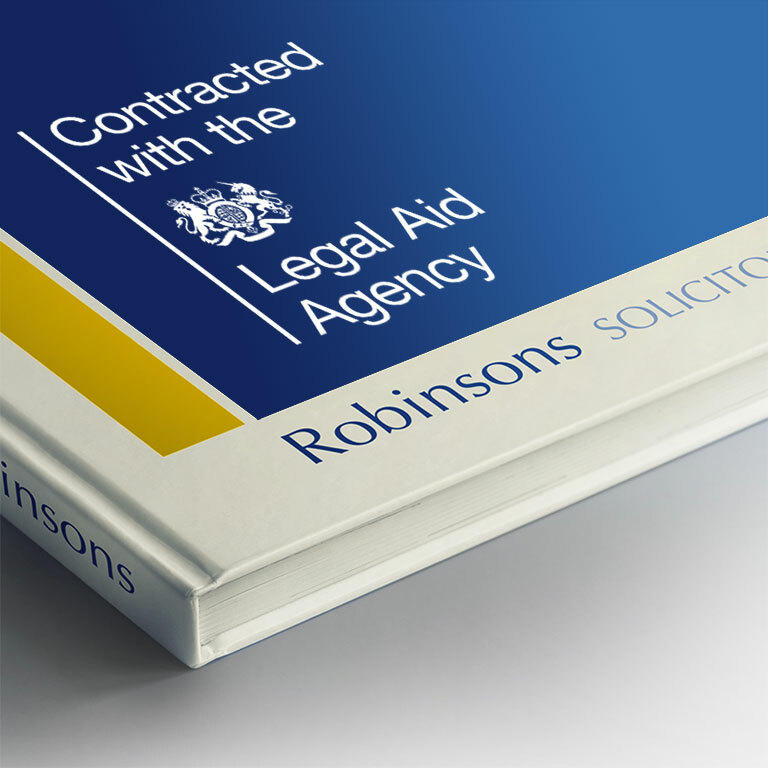 Did you know Robinsons remains one of the only firms locally continuing to provide Legal Aid Advice.